While Pebble is often attributed as the smartwatch firestarter, Samsung certainly wasn't far behind. In fact, Samsung was ahead of both Apple and Google when it announced the first Galaxy Gear watch in 2013, and has since put out a lot more. Its latest duo of watches, the Gear S3 Classic and Frontier, have just arrived (look out for our full review in the next few days). But how did Samsung get to here? What has the paper trail of patents told us about Samsung's ambitions for the past, present and future of its smartwatches? Let's investigate. In August, Bloomberg reports Samsung is preparing to launch a smartwatch, and even leaks the name: Galaxy Gear. In the same month, Samsung's Lee Young-hee talks openly about the upcoming watch. At its Unpacked event at IFA in September, Samsung unveils - sure enough - the Galaxy Gear. The rectangular wearable isn't ugly, but its rigid design makes it a bit uncomfortable to wear. There's a 1.9 megapixel camera on the strap that's capable of shooting video (years later, we're still trying to perfect the wearable camera). 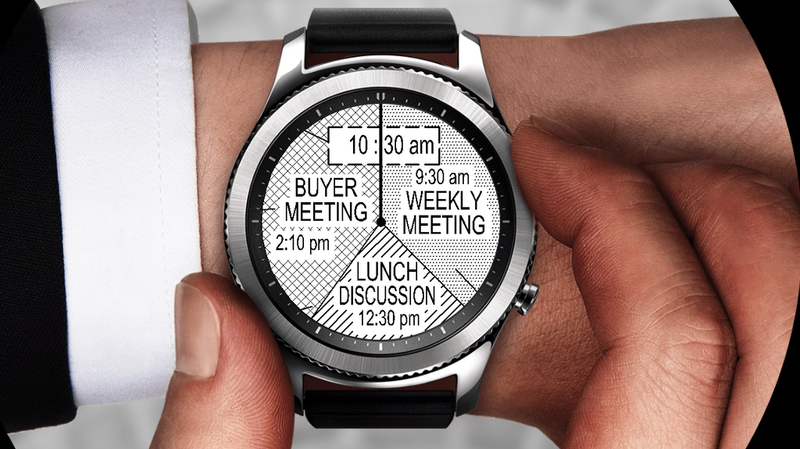 The software is Android-based but not Android Wear; the next year Samsung will replace this with a Tizen-based OS. In the same month a patent appears for a much more advanced smartwatch with a flexible display. The screen would move around the watch depending on the angle, so as to meet the user's eyeline. The device would also be able to detect when the two ends are connected, indicating that someone has put it round their wrist, and switch on in response. Samsung announces the Gear S, which is similar to the Gear but adopts a curved Super AMOLED screen, comes running Tizen, and offers cellular connectivity so it can be used to make calls and send texts without your phone being anywhere nearby. Some of Samsung's flexible ambitions make it into the watch, but it's certainly not reaching as far as patents prior and since. Samsung is awarded a patent for a smartwatch controlled by a ring around the display. Like the Apple Watch's digital crown it offers another way of interacting with the device that's more "watch-like" than a button. The pictures show the ring being used to control calendar functions. At this point Samsung doesn't have a circular smartwatch, but rumours abound that one is in the pipeline. Samsung says it will be possible for it to start making foldable phones in 2016. Could this apply to its wearables too? The USPTO reveals a patent for, once again, a watch with a fully wraparound display. However, the flexible design would mean it could be straightened out to perform other functions on a flat screen. The device features communication and multimedia functions, the latter of which could include listening to music or watching video - especially when it's laid flat. Samsung files a patent for a watch that can project a display onto the back of the wearer's hand. Not just that, the projected screen would be a UI, letting the user control features of the watch by tapping on their skin. In another example, a map is displayed on the watch's screen while information about a location is beamed onto the hand, allowing the user to see additional information more conveniently. It even shows some icons being projected onto a person's fingers for extra buttons, and the patent says the projection tech could adapt to uneven surfaces. To this day the idea hasn't surfaced, and certainly seems a bit ahead of the times, but if anyone's going to try out something like it it'll be Samsung. Samsung reveals the Gear S2, its first circular smartwatch, and it's a looker. The crowd goes bananas. We really like it. And look, there it is, as it was foretold - the rotating bezel. Like the projected UI idea, it's discovered that Samsung filed another patent in 2015 for a watch that would scan the back of the user's hand and analyse the structure of their veins. It would then use this to identify the wearer, with the watch showing personalised information and settings to that user. Perhaps more usefully, it could stop a stranger accessing sensitive information. A Fast Company report claims Samsung has stepped away from Android Wear entirely, and will only develop its future wearables on Tizen. Samsung dismisses the report, but to date the Galaxy Gear Live is the company's only smartwatch to run Google's OS. June 2016: Shape shifters ahead? File this under "ideas for Minority Report 2". A patent reveals an idea for a 3-in-1 foldable device that could be used as a smartwatch, phone or tablet. It's similar to the previous flexible concept, but with the addition of transforming into a tablet. Samsung has revealed some of its bendy phone prototypes already, so perhaps this isn't so far off, but it still feels very "out there". The patent focuses more on the way it would transform rather than any of the specific smartwatch functions, but it reinforces Samsung's interest in flexible, multi-purpose devices. However, lest we forget that Lenovo tried something similar itself, and we're not sure we'd fancy something that bulky on our wrist. At IFA 2016, Samsung reveals the Gear S3, which comes in two models: Frontier and Classic. Again we see the rotating bezel, but despite many of the patents we've seen, Samsung is more concerned with making a smartwatch that feels like a proper timepiece, and that's fine with us. Much of the IFA conference is spent talking about design. Samsung files for a smartwatch patent that includes, for some odd reason, sketches of the Apple Watch. The internet loses its collective mind. Samsung has by now announced that it plans to launch a flexible phone soon, and in fact promised a foldable phone this year. That now seems unlikely, but 2017 is looking good, especially with the latest patent reveal. This one reveals a flexible device similar to ones we've seen prior, but as Galaxy Club spots, it now has a name: Galaxy Wing. Could this be the next evolution of the Gear? With the Gear S3 Samsung has shown it wants to make watches that blend in, but its patents reach for much bigger ideas - as do its plans for flexible technology. It clearly has its sights set on applying this to wearables, and who knows, maybe 2017 will be the year.